It is possible that the colour trend of spring summer 2018, be it for garments, cosmetics, beverages or for condiments, might have been inspired by flowers that add some rare hues to the surroundings—baby blue, indigo, lavender, lilac, royal blue and several other variants. One such flower, butterfly pea, is abundantly found in southern India. Nearly every house here has this perennial vine, adorning the hedge or the gardens. My earliest memories of the flower, known as shankhpushpi, aparajita and sankhali in different parts of the country, is a song written by well-known Malayalam language poet Vayalar Ramavarma and sung by K J Yesudas: Shankhpushpam kannezhuthumbol Shak unthale ninne orma varum... (The flower reminds king Dushyanta of the beautiful eyes of Shakunthala...) My mother would diligently listen to it whenever it was broadcast on Radio Ceylon. But it’s only recently, while researching for the article, I realised the beauty of the lyrics as well as the flower, which though devoid of fragrance has captured the imagination of poets and has come to be known as a romantic flower. Shaped like a conch, the butterfly pea flower, or Clitoria ternatea as it is described in scientific lexicon, is a delight to behold. In Hindu religion, the flower is used in the worship of Goddess Durga and Lord Shiva. 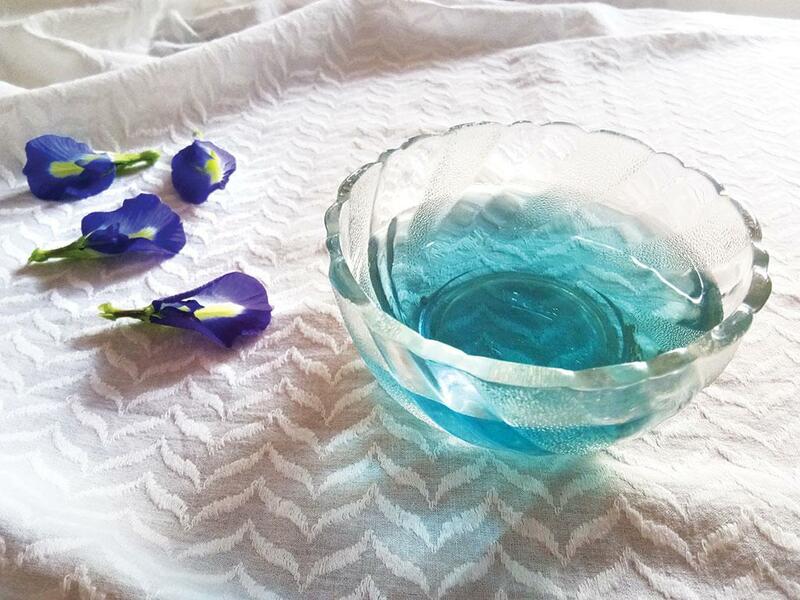 In fact, Hindu mythology has it that butterfly pea is a heavenly plant brought to earth by Guru Shukracharya. Some studies offer a plausible explanation why the plant is revered. “The plant has therapeutic values and can be used in the war against diabetes,” says a study published in the January 8, 2018 issue of BMC Complementary and Alternative Medicine. The researchers tested the effect of Clitoria ternatea tea (a beverage made using the flower extracts) on healthy men and found that their blood glucose and insulin levels were lower even if they consumed the tea with sucrose. This reduction did not happen when the tea was consumed without sucrose. The researchers now plan to study the effect of the tea when consumed with complex carbohydrates such as white rice and bread. Positive results would prove a simple food based interventions to fight diabetes, says the study paper. In some Asian countries it is believed that consumption of the flower promotes a younger skin. Researchers investigated the protective effect of the flower and found that it contains polyacylated anthocyanins and flavonol glycosides as major constituents, which protect skin cells against oxidative stress or damages by ultraviolet rays and hydrogen peroxide. The study was published in Phytotherapy Research in February 2018. The use of different parts of C ternatea plant in folk medicines has also prompted Malaysian researchers to investigate its impact on cancer cells. Preliminary results show the plant extracts have significant effects on breast cancer cells, they said in the International Food Research Journal in January 2013. Studies have shown its cytotoxicity and anticancer properties could be due to the presence of flavonoids. These therapeutic properties of butterfly pea have long been documented in Ayur vedic texts, which particularly recognise the plant’s action on the central nervous system. Extracts of the flower are traditionally used for the treatment of neurological disorders or as a brain and nervine tonic and laxative. It is also used to thicken hair naturally. Along with brahmi (Centella asiatica), the flower is known to be used to sharpen memory. But what makes it a potent herb is that it has little side effects. Several leading Ayurvedic brands today offer shankhpushpi juice as a health tonic. Scientific evidence notwithstanding, the flower is extensively used in several cuisines across Asia (see ‘Shankhpushpi tea’). In South East Asia, the royal blue ones are used to colour rice. In Thailand, they are used to impart a blue colour to cakes and other dessert delicacies. In India the flower is gaining popularity as a food colourant. One can buy the dried ones online and from Ayurvedic shops, but has to be careful as several other flowers, such as Convolvulus pluricaulis, Evolvulus alsinoides and Can scora decussate, are also known as shankhpushpi. But there is nothing like plucking fresh blue flowers and brewing a soothing cup of tea. Let the flowers steep in boiling water for five minutes. The water turns a wonderful blue. Strain the water and add the required amount of sweetener to it. In case, you want to enjoy tea of some other shade, add a few drops of the fresh lemon juice to it. Voila! The colour turns a deep purple to light pink, depending on the amount of lemon juice added. You can also consume the drink cold by refrigerating it or by adding ice cubes to it. Refrigerate the tea in kulfi moulds and you have a blue lick-lolly or a pink chuski!